I came across this uncirculated 1920s French postcard of Le Port Saint-Nicolas in Paris (translated as St. Nicolas Harbour on the back of the card) on a market stall at Rome's most famous flea market at Porta Portese. It reminded me instantly of the postcard of the Pool of London that I last looked at on this blog, although this shot seemed to me to have something extra special about it that set it apart from the usual run of the mill topographical tourist postcards. Whilst it's less evident in the scan above, the tonality of the print is absolutely gorgeous and there's a real sense of depth – the foggy distant river bank and the reflective sheen on the water are in stark contrast with the looming steamer and dockside ships. Printed by the Parisian publisher Edition d’Art Yvon, it was issued as number 46 in series 3 of Paris...En Flanant - Strolling around Paris – which featured scenes of less typical and carefully photographed Parisian views such as this. Pierre Yves Petit was a Parisian photographer who began publishing postcards of his photographs under the trade name Edition d’Art Yvon in 1919, signing the front of the cards with the pseudonym"Yvon". 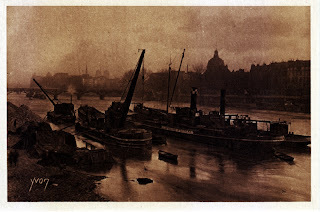 Initially using the black and white collotype method, he then moved onto bromide sepia tinted cards, finally adopting the “modern” rotogravure method in 1923. The Yvon name is still used to this very day and there's a potted history on their website here (in French). Port Saint-Nicolas, a once busy cargo port, took its name from from the neighbouring collegiate church, but is today know as Port du Louvre. The quay where cargo ships docked is now a promenade for pedestrians running along the Seine from the Pont des Arts, which is just visible in the background of this postcard, to the Pont Royal. Check out the Vintage Postcard Store for more Vintage Postcards of France!